Flipper Bucket - Reach It! - Move It! - Crush It! Flipper bucket is designed for clearing snow in large areas or in areas where snow must be moved long distances. Thanks to the independently controllable side wings the bucket is exteremely versatile in snow clearing and can be operated in smaller areas as well without problems. 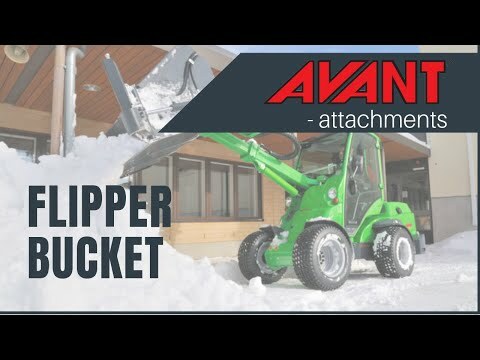 With the flipper bucket you can move a very large quantity of snow in one push. Because the wings fold out slightly forward from the sides, you can push 2-3 times the capacity of the bucket between the wings. Both wings can be operated independently. This makes the bucket easy to control also in narrow or tight areas.